This post took me quite a while to put together, mainly because I was sifting through vacation photos, and we all know how long that can take. A couple weeks ago, I went down to Monterey for the weekend, and I wanted to share my adventures there. The problem was, choosing from all the photos I took became a week-long endeavor! Anyway, I love the California coast because it's so easy to drive even an hour and be somewhere completely different – totally new scenery, climate – even the air smells different. We decided that a little escape from the urban claustrophobia of San Francisco (also: San Francisco gets downright cold in summer!) for some more wide-open spaces and sunnier skies down south. So on an overcast Friday morning, we hopped in the car and made the hour-and-half drive down to the Monterey Peninsula. Our first stop once we arrived, in true foodie style, was for lunch! 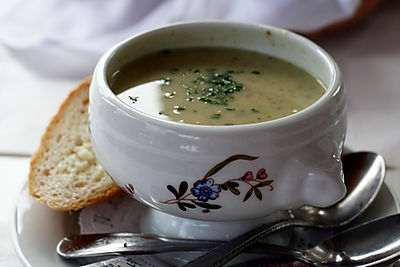 We went the to Red House Cafe, a little restaurant in Pacific Grove that embodies down-homeyness to a T.
Potato leek soup. Warm and cozy, perfect eaten on the porch of the cafe after a long drive down from San Francisco. For dessert, we could choose from a vast array of pies, puddings, cakes, and cookies. 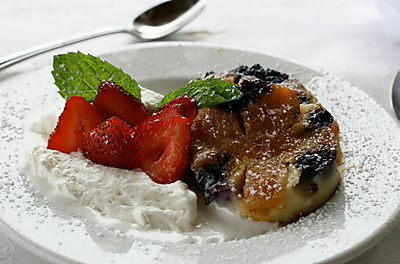 I went for the special of the day, a peach and blueberry clafouti. More on this later. 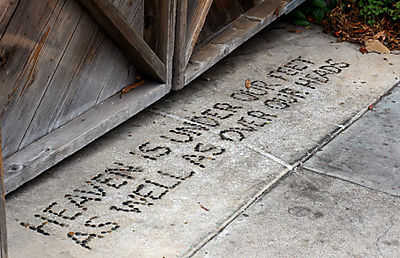 Seen in Pacific Grove: quirky and lovely, just like the town. We took a stroll along Asilomar Beach, which is at the edge of Pacific Grove. 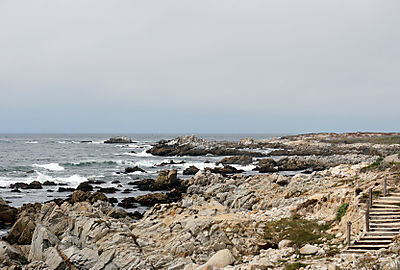 This is typical scenery at Monterey and Carmel: overcast, chilly, the sky a pale blank and the sea a sullen grey, the rocks artistically rugged and foreboding. Whether in good or bad weather, the California coast has never been soft or gentle, but a challenging, rough-hewn feast for the eyes. 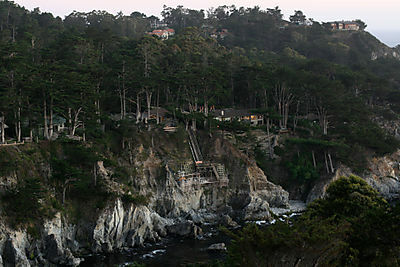 We stayed at the Tickle Pink Inn, which is nestled in the Carmel Highlands and enjoys a view of the ocean and coves. I took this the next morning, before the fog had burned off: the mist-softened landscape and hypnotic crashing of the waves gave the scene an unworldly serenity. 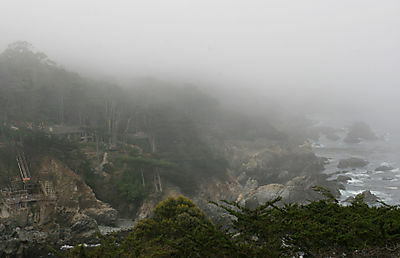 I'm sure all the inns and hotels in this area all boast of fabulous views, so really, all I recommend is that if you haven't visited Monterey or Carmel or Big Sur, do so because it's such an all-encompassing sensory experience. Although I did enjoy the Tickle Pink Inn very much – and who can resist the name? 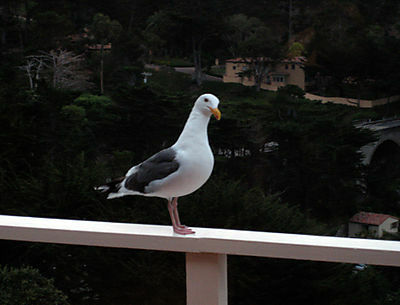 Here's a friendly gull who liked to perch on our balcony railing. He would drop by to visit several times during our stay. 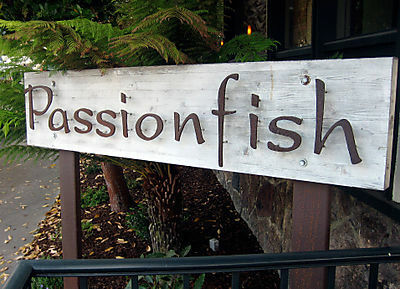 Passionfish is a restaurant passionately dedicated to serving sustainable seafood, and in Monterey, one of the epicenters of the sustainable seafood movement, there seemed no better place to dine our first night. The dining room is unprentiously elegant, the service intelligent and friendly. My hand-lined mahi in a black pepper-rum sauce was richly piquant, and dessert was equally satisfying: a white peach cobbler. We went up to Carmel the next morning. Looks just like Hawaii, doesn't it? Except for that massive fog bank hanging off the coast. This shot isn't particularly well framed, but I like it because I notice you can see little stories going on with the people: You can see a couple strolling down the beach, a little girl running back to her mother with her father trailing behind, and off in the corner, a woman playing with her dogs. Isn't it cute? 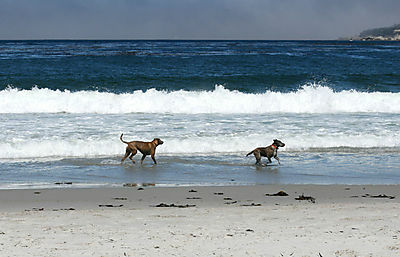 Carmel Beach has some Hawaii-worthy white sands, and is also dog-friendly: here are a couple of canine buddies having some fun in the surf. 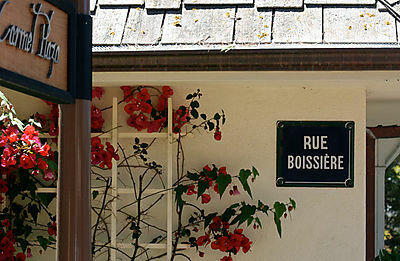 After the beach, we made a beeline for Patisserie Boissiere in Carmel-by-the-Sea, a classic French bistro that also offers up fabulous pastries, Paris style. Their strawberry triangle is a flaky delight of puff pastry, pastry cream, and fresh fruit, and their banana chocolate cream tart was a sophisticated take on banana cream pie. This place is also perfect for picking up a lunch to enjoy al fresco down the the coast. 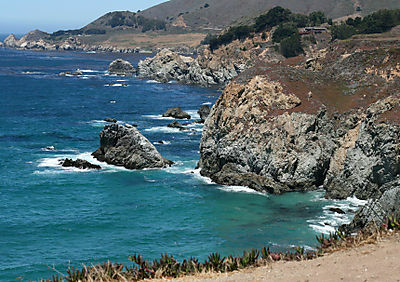 We continued our drive down the coast towards Big Sur. When the sun is out, the waters turn the most gorgeous shades of turquoise, cerulean, and jade. 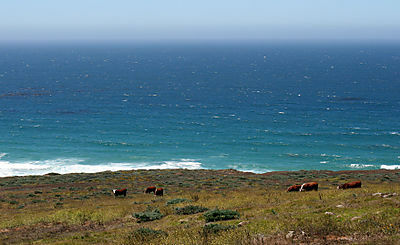 These have to be some of the luckiest cows ever: grazing with a view. 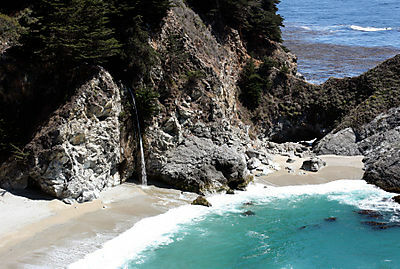 We made it as far down the coast as McWay Falls, one of the most famed sights in Big Sur. This 80-ft high ribbon of water is actually a tidefall, as it empties directly into the ocean. This is about as close as you can get to this transcendentally beautiful cove; public access is prohibited, ensuring that this view will remain untrammeled by the touch of humans. 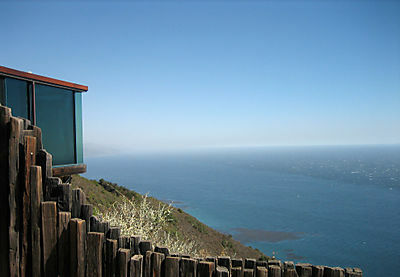 This is the view of the Pacific from the Post Ranch Inn, a ridiculously sybaritic hotel perched on the edge of the Big Sur cliffs. Sadly, we did not get to stay here, but we did venture onto the property to see what the fuss was all about. And I have to admit that in a weekend full of gorgeous views, these were far and away some of the most stunning. This view (as well as the one above) were from our room balcony. I love how you can see the lights going on in some of the homes; it looks so lush and dreamlike, like cottages in a Hansel and Gretel forest. 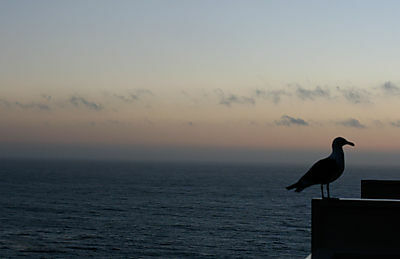 Here's our gull friend again, admiring the sunset as well. Imagine! He gets to see this view every day, for free! On our way back north the next day, we stopped by Santa Cruz, a true bohemian laid-back surfer town, and the Santa Cruz Beach Boardwalk in all its glorious childish cheesiness. 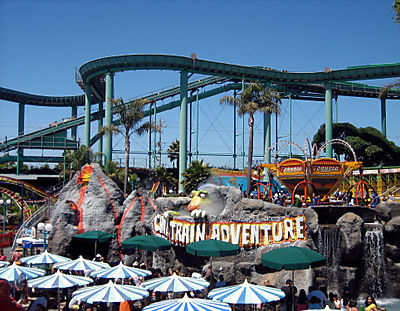 The west coast has never had as many of these amusement-parks-by-the-sea as the east, and the Santa Cruz Beach Boardwalk is one of the few remaining ones today. The Boardwalk is celebrating its centennial, and the city has clearly done a very thorough job of polishing up the place, which may be why it looked so much shinier and spiffier than in my childhood memories. Summer vacation was clearly in full swing when we arrived: families waited in line for the big old wooden rollercoaster or the log water ride; teenagers in swimsuits ran down to the golden beach or headed for the arcades, the smells of cotton candy, hot dogs, and grilled corn wafted our way, and our ears were filled with the cacaphony of happy people out enjoying themselves. 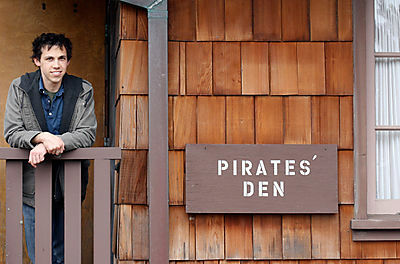 Notice a pirate theme in our vacation? 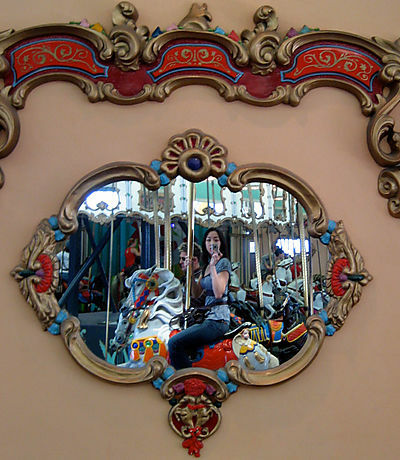 This was one of those pendulum-style rides where you're slowly swung back and forth and finally in a full circle. 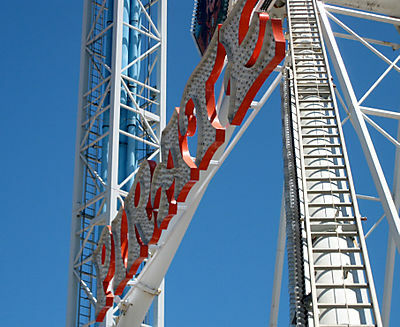 I didn't go on this ride, since it makes me rather queasy. It's amazing to me that in the space of a weekend you can experience so many different places, all within a few hours of each other. I don't know if this qualifies as a "stay-cation", as the buzzwords seems to be, but if it is, it doesn't seem to terrible to stay at home! One of my favorite desserts from the weekend was the peach blueberry clafouti from Red House Cafe, and once I got home I couldn't wait to replicate it. I think I got carried away and put too much fruit in there, but with peaches at their bursting-sweet ripeness I couldn't help myself. Combined with the tartness of the blueness and the creamy, vanilla bean-flecked custard, this makes for one sweet summer memory. Preheat the oven to 400 degrees F. Butter a 9-in baking dish or pie plate, or individual dishes, and place on a baking sheet. Wash and peel the peaches, and cut into small wedges. 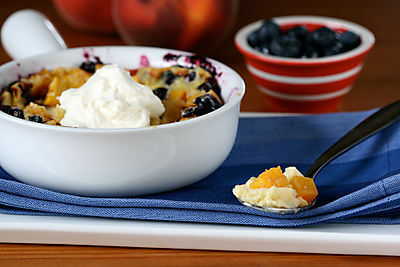 Combine the peaches and blueberries and 2 tablespoons sugar in a bowl and let macerate for about 15 minutes. Whisk the remaining sugar and eggs together in a mixing bowl. Add in the milk and whisk until combined. Sift the flour over the mixture and whisk until combined. Whisk in the vanilla bean paste. Spread th e fruit over the bottom of the dish. A single layer is fine; don't put too much fruit in or you'll overwhelm the batter. Pour the batter into the prepared pan, just covering the fruit. Bake in the oven for about 35-40 minutes (if you are making individual dishes, be sure to check halfway through to see if they are baking faster) until the batter looks puffed and golden and is set in the center. Let clafouti cool for about 10 minutes out of the oven before serving. You can also serve at room temperature – it will keep for about 12 hours. what a great getaway and this clafouti looks so good! nice way to use the season’s bounty! Those shots look a lot like the Eastern coast of Oahu! What a nice getaway. What lovley pictures. It looks like such a lovely, relaxing, and yummy trip. Thank you for sharing your photos. Thanks for sharing such lovely photos. Now I want to drive down the coast ! What a fun trip! The clafouti looks quite yummy too! How funny, on my trip at the end of the year I very much enjoyed both red house cafe and passionfish! Lovely photos! A wonderful weekend! Great pictures and a scrumptious recipe! Wow, everything about this post is beautiful! What a weekend! And that clafouti looks amazing – I can see why you wanted to replicate it! 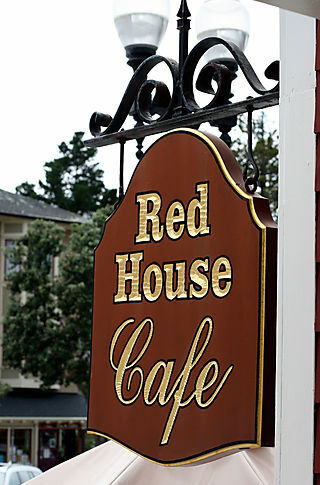 We went to the Red House Cafe last time we were in Pacific Grove! It was my favorite part of the trip (considering I was there on business). Looks like you had a wonderful trip. Your pictures are beautiful. We recently went to San Francisco in early August & it was freezing! Looks like a fabulous trip. Beautiful clafoutis, and don’t worry about putting too much fruits in there..more is more, right? wow, this looks like an amazing vacation! Organizing through vacay photos takes me forever… and so does unpacking; they’re both a constant reminder that the vacation’s over, haha! the clafouti looks wonderful!! What a beautiful blog you have! I just stumbled in from a Google search. I’m adding you to my Favorites. Great photos! I love that part of the country so much. And your clafouti looks divine! Your trip sounds fabulously fun. My favorite photo is of the potato leek soup. Yum! How lucky you so near to Carmel Bay. I visited in 1994 and I longed to visit again. I remembered clearly is those fat and cute squirrels who followed you around waiting for feed . How my daughters love them. I just love that drive down the coast. Big Sur takes my breath away! We also had a blast in Carmel a few summers ago. You’ve got some beautiful photo here. Seriously making this NY girl wish she was in CA 🙂 Thanks for sharing!! wow, this one is simple. i made one while back in asheville, nc and it was a bit of a production. i think mostly because i didn’t know how to properly make the tart crust. I have never been there but I really want to go after viewing your photos! It is a beautiful place. Glad you had fun..and of course the dessert looks amazing! This is why I love local blogs – I love seeing/reading about places that are familiar. 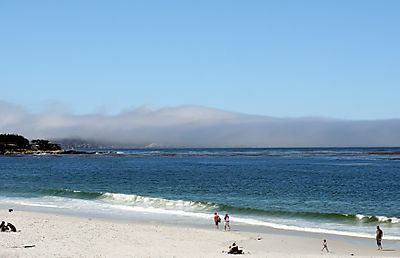 One of my greatest “Mom & Me” trips was to Carmel and Pebble Beach. So beautiful down there. And now that my boyfriend and I have our puppy – I think a trip back to Carmel is in order (something like the Most Dog Friendly City in the US). Loved this entry!! looks like u had a wonderful trip… and much success with the clafouti! Great photos! I enjoyed reading about your decision to attend pastry school. Wow, thanks for taking the time to share all of your beautiful pictures! It looks like it was a fabulous trip! wonderful trip! 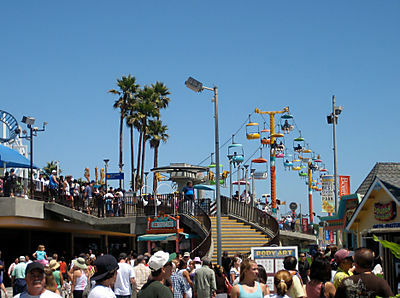 reminds me the time me & my family spent in Santa Cruz last year, it’s amazing! Some the colors look very tropical, don’t they? I can assure you though that it was nowhere near as warm as Hawaii! Thank you! It was my pleasure to share – so many good things to experience down there! thank you! Every time I go down I wonder why I don’t go more often – it’s so lovely! I went to Nepenthe too – it’s amazing, isn’t it! Except all my photos had my head in them so I didn’t have a good one to post! Thank you! It was fun – if too short, like all good vacations! yay for thinking alike! I’m glad you enjoyed those places too! Thank you! I was glad to share such a fun trip! Thanks so much! 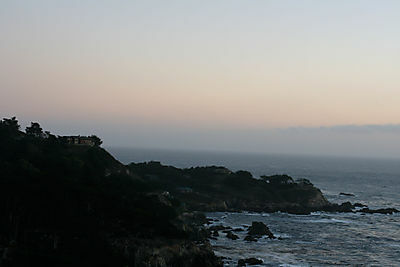 Carmel is so beautiful, it’s a great place to practice photography since beautiful views are everywhere! Thanks! Yes, Carmel is definitely not lacking in great desserts! Yes, locals tend to flee SF in the summer because it gets so cold! It’s definitely warmer outside the city! thank you! Yes, it was a really good time! Thank you! Yes, the SF “summers” are such a strange thing – always makes me want to escape! And yes, the fruits were so good I didn’t mind more of them! thank you! Every time I visit Carmel I wonder why I don’t visit more often. Yes, many “friendly” animals there still! thanks! 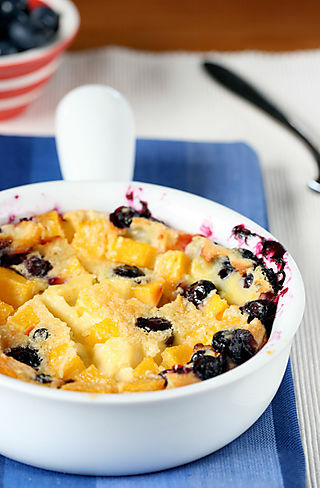 I’m glad you like the clafouti – it was good for extending the “vacation” feeling! Thank you! Yes, doing this post took forever but at least it forced me to organize my photos instead of throwing them in a corner unorganized. Ah…little blessings! Thanks so much! I’m glad you enjoyed blog and hope to see you around! thank you! Yes, I feel very lucky to live in such a pretty area and i should try to take advantage of it more often! thank you! Yes, that potato leek soup was very good – and I loved the bowl! Thank you! 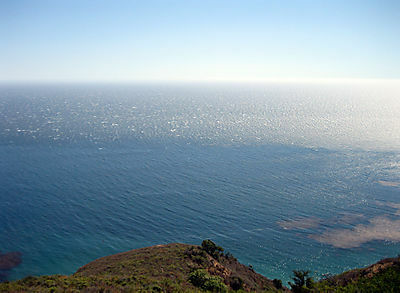 Glad to remind you of California’s beauty:) I miss NYC – so maybe we’ll cross paths one day! Thank you! Yes, all the delicious pastries definitely made the vacation complete! I’ve seen clafoutis with and without crusts – but trust me, without crust is just as delicious and a lot easier! 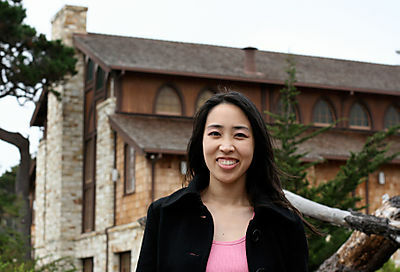 Whenever you make it back to CA you should try to visit Carmel – such a lovely place! And yes, delicious desserts there! Thanks! Yes, it’s always fun to recognize places in other people’s blogs, and think, “hey, I should go there!” You should definitely take your puppy (who is the most adorable thing in the world, btw) to Carmel Beach – it was filled with doggies that looked they were having the time of their lives! You are so sweet to think of me! Your vacation looked and sounded so jam-packed, I can’t imagine how you could have squeezed more in! But it was great to know we in the same time zone for a while:) And yes, if Mike and I (you are totally inflating his ego, btw, with your comments:) ) come out to Colorado again we’ll surely let you know! Hope you’re well! thanks! yes, it was fun recreating desserts from vacation – and I think it came out pretty yummy! thanks so much! I’m glad the pastry school post was interesting to you, I hope it helps people wanting to make the big decision! thanks so much! I had a great time and it was really fun to share it with everyone! I’m glad you had a good time there too! It’s such a fun place for vacation! I absolutely love the Patisserie!! It’s awesome. You should also check out Fifi’s Bistro Cafe in Pacific Grove. They have an amazing bakery in the front of the restaurant. They used to make a lemon poppyseed sandwich cookie with a lemon cream filling that was AMAZING!! What an amazing holiday! Your photos are stunning, as always, especially the on3 of Big Sur. Gorgeous!